Displaying poll results using the pie chart component – How can we help you today? Pie charts are a useful way of displaying poll results. 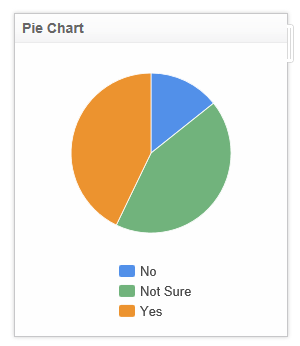 In our example, the pie chart component is used to display three categories of responses: Yes, No, or Not Sure. Goal: Use COUNTDISTINCT and GROUP functions to visualise poll results. Where B:B is the column that contains the poll results. Click COUNTDISTINCT to highlight the whole formula select Evaluate current selection Result: 1, 3, 3. (Note: shows the total number of votes in each category).